Budgetcatcher gathers 10 best attractions in Chiang Mai for you. Home / Car Rental Chiang Mai Airport / Budgetcatcher gathers 10 best attractions in Chiang Mai for you. 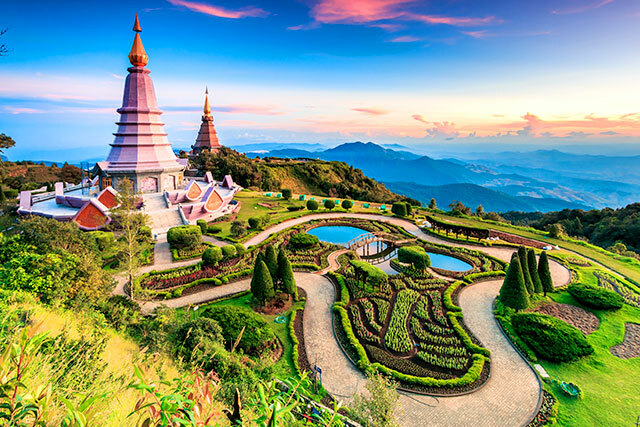 As one of the most popular destinations of Thailand, Chiang Mai welcomes travelers with hundreds choices of interesting attractions scattered in every part of the province. So, if you have just a couple days stop at this fascinating northern city, where will you go to get the “real essence”? BUDGETCATCHER gathers 10 best attractions in Chiang Mai for you. See below and plan your dream trip to discover the charm of the northern Thailand. Wat Phrathat Doi Suthep is the most important and one of the most known temples, not only in Chiang Mai, but all over Thailand. It is 15 kilometres from town. You can drive there or catch Song Thaew bus from the foot of the mountain on Huay Kaew Road. 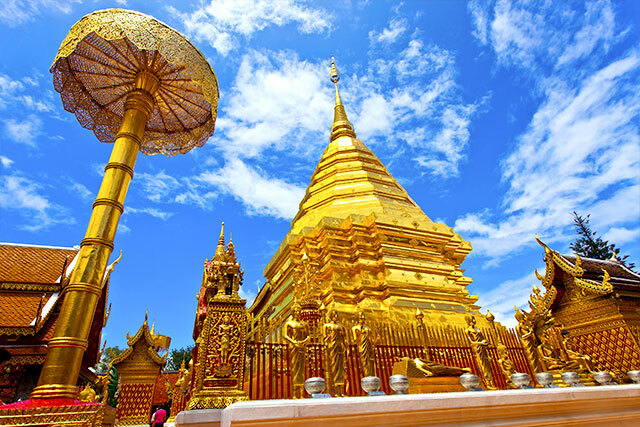 On the top situated golden pagoda called “Phrathat Doi Suthep” dates from 1383. The temple’s golden pagoda contains holy Buddha relics and attracts Buddhist pilgrims from all over the world throughout the year. It is one of the most sacred pagodas in Chiangmai, and the pilgrimage place for people who born in the year of goat in Chinese and Thai calendar. Also, This is one of the best place to catch the scene of Chiang Mai city and surrounding countryside as the temple compound offers an exhilarating view. Make sure you arrive in the evening to catch the view of the city dying with orange tint from the sunset — one of the must see in Chiang Mai. Doi Inthanon Natural Park is home to Thailand’s highest mountain, evergreen forest, and many lovely waterfalls — some of them ranked among the most beautiful waterfalls in Thailand. From Chiang Mai, you can easily reach with just 80 kms drive down south. Go up the road through lush jungle and you will reach the highest peak of Thailand at 2565.3 meter above sea level and amazing viewpoint at Phramahathat Napamathanidol and Phramahathat Napaphol Bhumisiri. There are many walking trails covered with lichens and wild orchids in the park. Also, here is one of very few places in Thailand you can find frozen dew in winter. 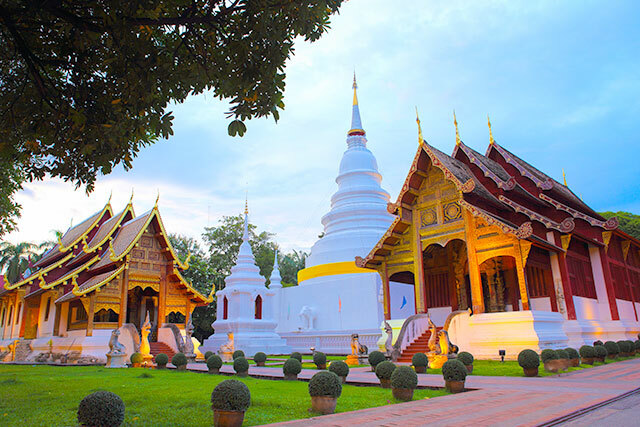 Located in the heart of the city, Wat Chedi Luang is one of the most visit temples in old town Chiang Mai. This temple is known for enormous pagoda originally 280 feet high, which was partially destroyed by an earthquake in 1545. At one time, Wat Chedi Luang housed the revered Emerald Buddha image now enshrined in Bangkok’s Wat Phra Kaeo. Apart from the pagoda, you will find many beautiful heritage sites within the temple’s compound. The main highlight is teak wood ordinate hall; built in 1928 with a magnificent Naga staircase adorns the chapel’s front porch. This said to be one of the most lavish hall of all in Chiang Mai. 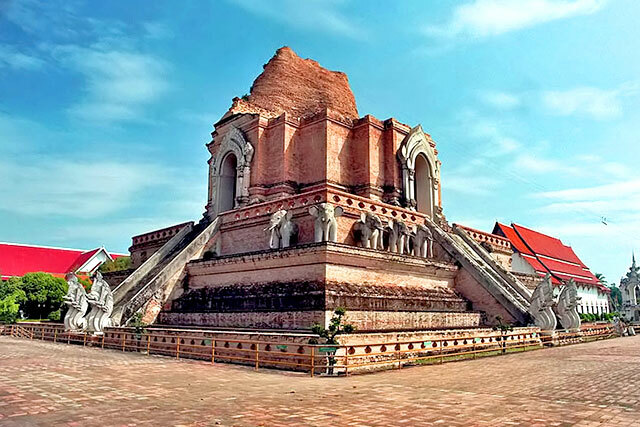 Apart from Wat Chedi Luang, Wat Phra Singh is another popular attractions in Chiang Mai old town and list among the must visit places of the city. This temple dates from 1345 and is one of the focal points of Songkran festivities from April 13-15 when people bathe the revered Phra Buddha Sihing image. The temple compound includes many sightings with the main highlight on Wihan Lai Kham, 700-year-old teak building with exquisite woodcarvings and northern-style murals. Another spot you should not miss is the 200 years old Ubosot situated on the side white Kulai Chedi, and Ho Trai (temple library) which is the great example of Lanna Arts. 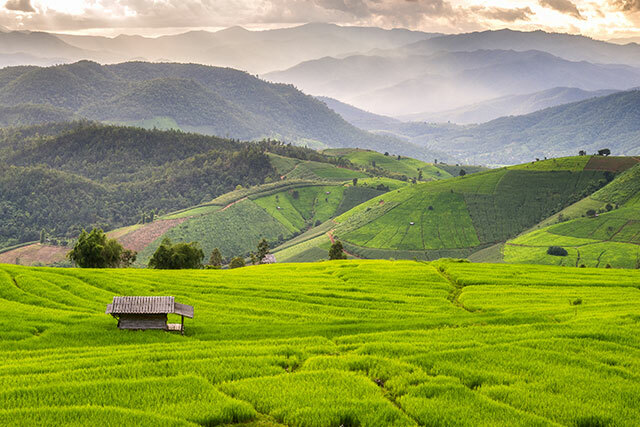 Within less than an hour from the city, you can find a lovely Doi Pui Hmong Hill Tribe Village. This tribal village is some 4 kilometres from the Phu Phing Palace, and offers vignettes of modern tribal life. There are cute Hmong Museum, garden and a small waterfall for you to enjoy. Meet with lovely Hmong propel seeing their fascinating yet simple way of life or hire a student tourist guide to take you a good tour through their village. Along the stairs leading up the hill, you will find shops selling various handicraft souvenirs — silk, clothes and silver jewellery. Make sure to have a stop, as the price well cheaper than handicraft shops in Chiang Mai or Bangkok. 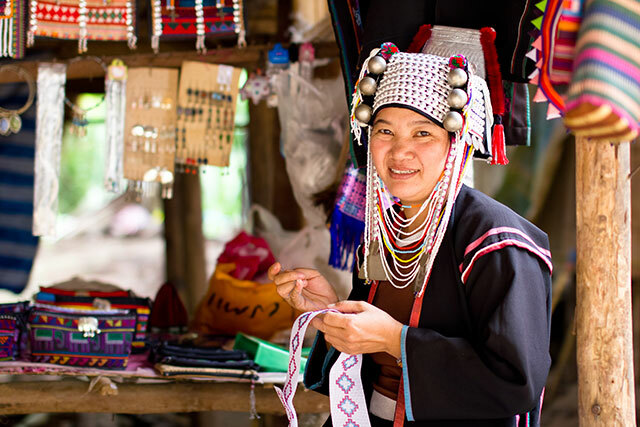 Bo Sang Umbrella Village is one of the most famous handicraft village located 9 kilometers from Chiang Mai downtown. Along a road, you will find many shops selling handicraft products and small family owned factory. 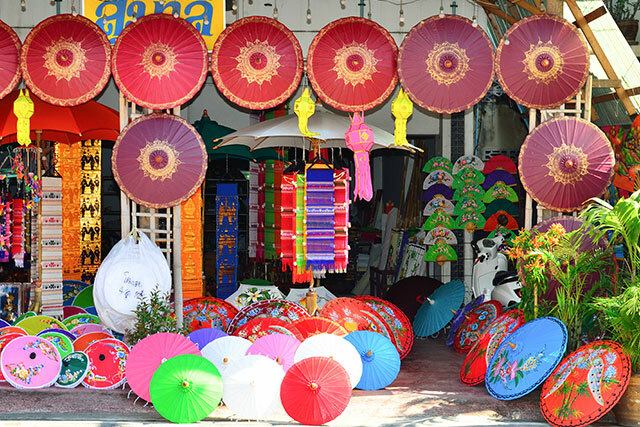 For more than 200 years, Bor Sang is known for umbrella and parasol making. Make a stop and visit one of the small family factories making umbrellas, seeing young women make silk and cotton umbrellas and paper parasols, which are then hand painted in various animal and floral designs. 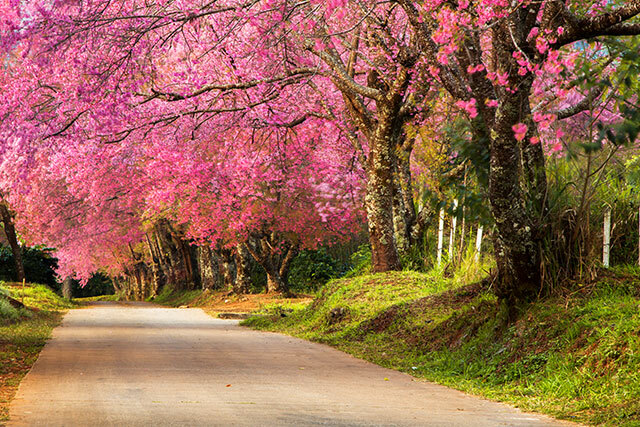 Baan Khun Chang Kian or known as Khun Chang Kian Highland Agriculture Research Center is very well known among Thai people for where to see Nang Phaya Sua Krong or Thailand sakura during the cold season. 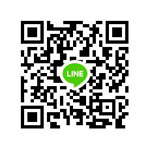 It locates about 14 Kms away from from Wat Phra That Doi Suthep. Every years around beginning-mid of January, thousands visitor visit here to see the beautiful panorama of the mountain dyed into pink colour by humble pink Nang Phaya Sua Krong blossoms. 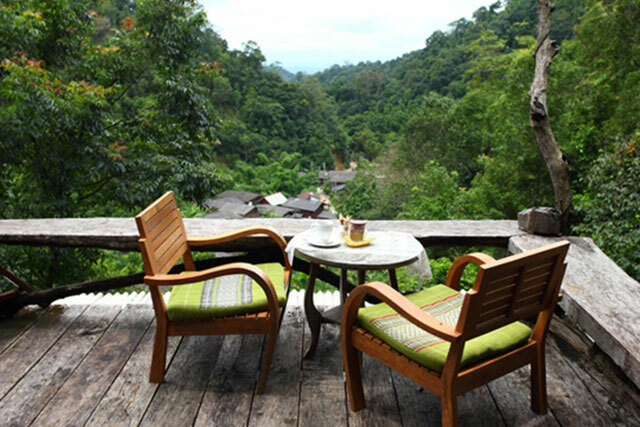 Baan Mae Kampong, small village amid the pristine valley of Mae On district that is known for beautiful scenery of stream runs through peaceful village and relaxing atmosphere. This village has cold climate all year round and lately become a popular stop of travellers visiting Chiang Mai. If you are looking for a change from Chiang Mai city or a place to feel at peace and forget the all stress, Baan Mae Kampong is the place for you. At the village, you will enjoy with slow-wind mood. Visit the waterfall in the village and indulge yourself with the beauty of the nature, talking to lovely villagers, seeing their peaceful way of living or make a stop at coffee shop sipping a favourite cup of local grown coffee and tea with a dazzling view as complement. Mae Sa Elephant Camp is among the best places you see these magnificent animals demonstrating their intelligence and skills, and cuteness. This giant creature is close bound with Chiang Mai propel for centuries and now you can see it up close. 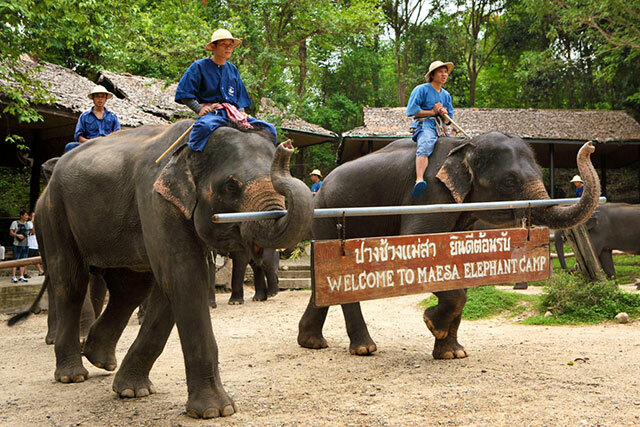 Mae Sa Elephant Training Centre is some 30 kilometres from Chiang Mai downtown. Here you can see many shows and demonstrations starting with watching elephant bathing on both sides of the bridge over the river, watch the shows of abilities, where visitors are greatly fascinated and impressed with abilities of Thai elephant at Maesa Elephant. This is yet to include an opportunity to have a jungle tour on elephant back through neighbouring forests, feed milk to baby elephants, or even train to be a mahout (trainer)! Baan Pa Bong Pieng, one of the most beautiful terraced paddy fields in Thailand located in Jom Thong district, around 100 kms. from Chiang Mai city. From May to Aug, it is green with newly planted rice on the field that gently slopes down to the valley before mountainous view. The rice will ripe around Oct – Nov, painting the valley with gold color. If you love taking photo, visit Baan Pa Bong Pieng in the afternoon is the best, as you can catch the last light of day. In addition, Baan Pa Bong Pieng is a good place to catch the life of Pakakayo people, ethnic minority living in the area.